It’s no secret that we’ve got a love/hate relationship going on with on-screen virtual keyboards. Love the convenience, hate actually trying to hit the right little squares on the screen. 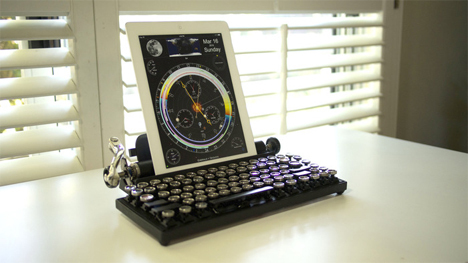 We prefer the tactile feel of keyboard, and Brian Min of Qwerkytoys has made us squee with delight at the Qwerkywriter, a USB and Bluetooth-enabled keyboard with the sensory satisfaction of an old-fashioned typewriter. 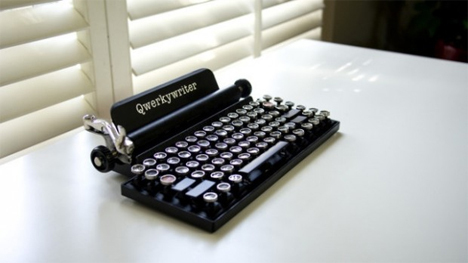 The Qwerkywriter is a mechanical keyboard that gives the lovely clicky feels and sounds that today’s keyboards lack. As you press each key, it gives that satisfying clunk – and the makers are planning to add a return bar function to it in the future, hopefully complete with the jaunty bell sound that vintage typewriters sport. Able to connect via USB or Bluetooth to your desktop, laptop, or tablet, the 84-key Qwerkywriter comes in a standard US Windows configuration, but Mac and International layouts are also available. A tablet up to 5/8″ thick can fit onto the keyboard’s little platform, which creates a nice little hybrid machine that looks surprisingly futuristic. These photos depict a hand-made proof of concept prototype. 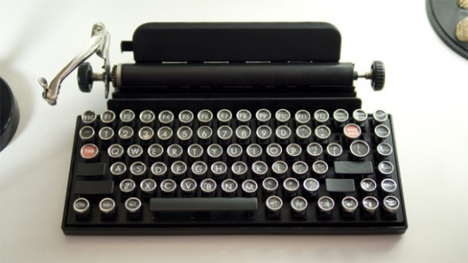 The mass production of the unusual typewriter was funded by a Kickstarter campaign that raised far more than its goal. Early orders for the keyboard ran $289-$299, but at the moment it’s not clear what the retail price will be for the finalized product. See more in Retrofuturistic or under Vintage & Retro. July, 2014.